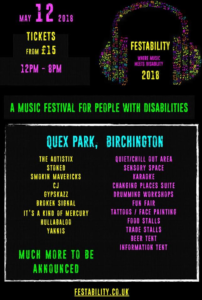 Come on down to a Music Festival especially set up for people with disabilities. Enjoy the music, join in with the music at the Karaoke or chill out in the quite room. Have even more fun at the fair or pop in and amaze your senses in the sensory room. If you get peckish why not enjoy some yummy food from some of the many food stalls. With plenty so do and see you’ll never be bored!! So why not come on down we hope to see you there at Quex Park, Birchington. 12pm – 8pm on the 12th May 2018 tickets from only £15.